Researchers at Duke University have devised a way to see through walls using a narrow band of microwave frequencies without any advance knowledge of what the walls are made out of. Besides having obvious applications in the realm of security, the approach could lead to inexpensive devices to help construction workers easily locate conduits, pipes and wires. The study was published in the journal Optica on Dec. 5, 2017. Current approaches also typically rely on knowing what material the wall is made out of before trying to see through it. 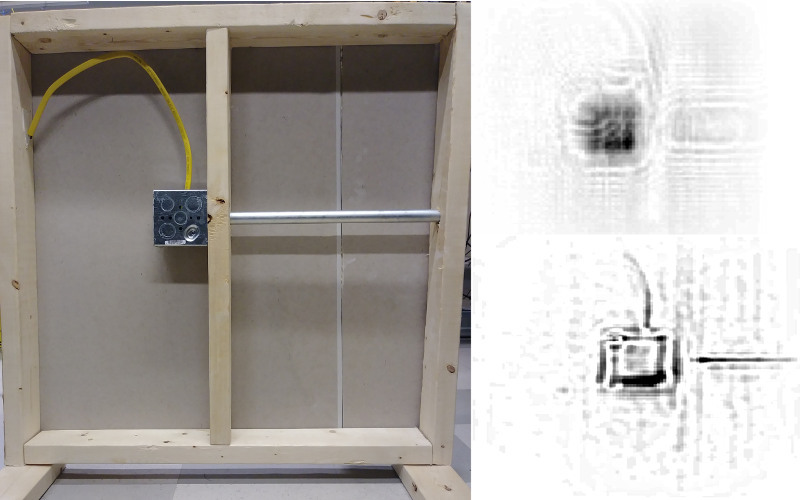 This allows the software to predict how the wall will affect the scanning waves so that it can separate the echoes and distortions from the solid objects being sought. In the new paper, Marks and his colleagues David R. Smith, the James B. Duke Professor of Electrical and Computer Engineering, and Okan Yurduseven, a postdoctoral researcher in electrical and computer engineering at Duke, take advantage of a wall’s symmetry instead. Because walls are generally flat and uniform in all directions, they distort waves in a symmetrical fashion. The newly described technology uses this symmetry to its advantage. The technique uses only a single frequency to scan because it cuts down on the number of interference patterns created by the wall and single-frequency emitters are much less expensive than broadband emitters. Sticking to a narrow range also means that a future device would be easier to clear with the Federal Communications Commission (FCC), as it would be easy to avoid interfering with microwave frequencies dedicated to other technologies, such as Wifi, cellular phone service and Bluetooth. The researchers built a prototype device to see how well it would work. In their laboratory, they constructed a couple of different kinds of walls and then placed objects behind them that a worker might want to find, like studs, electrical conduits, wires and junction boxes. Looking at the raw data after scanning through gypsum plasterboard, it’s difficult to make out anything other than a metal junction box, which is 4 inches wide and 2 inches thick. But after analyzing the data and removing the symmetrical patterns, the pictures clear considerably, and each individual component is easily recognized. This work was supported by the Air Force Office of Scientific Research (FA9550-12-1-0491).